TV show dates: August 13, 2017 — present. Performers include: Chris O’Dowd, Ray Romano, Sean Bridgers, Lidia Porto, Megan Stevenson, Goya Robles, Lucy Walters, and Carolyn Dodd. 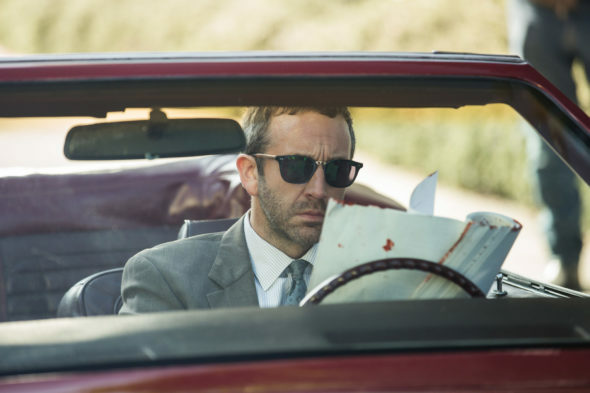 A dark comedy, based in part on Elmore Leonard’s 1990 novel, the Get Shorty TV show follows Nevada hitman Miles Daly (O’Dowd), who wants to get out of the mob and win back his wife. When his boss sends him to Los Angeles to hunt down a gambler who is deeply in debt, he decides to take a shot at movie making career. Once in Hollywood, Miles connects with movie producer Rick Moreweather (Romano), who is struggling to keep his sagging career alive. Rick reluctantly partners with Miles and tries to teach him the show biz ropes. Ambitious studio executive April (Stevenson) used to be Rick’s assistant. These days, she’s only interested in blockbusters, but Miles has the goods on her and applies pressure until she agrees to work with him. Miles’ estranged wife, Katie (Walters), put herself through night school and is now a physician’s assistant in a plastic surgery practice. This working class Nevada native wants nothing to do with Miles’ extra-legal pursuits. And now she has a new boyfriend, much to her husband’s chagrin. Intelligent and practical, Miles and Katie’s 12-year-old daughter Emma (Dodd) is still daddy’s girl. Thanks to her father, Emma has stars in her eyes, and gets drawn into the production, while Katie’s objections fall on deaf ears. Along with his partner in crime, Louis (Bridgers), Miles tries to keep his fledgling filmmaking career separate from his dealings for the mob. Meanwhile, he’s trying to allay the suspicions of crime boss Amara De Escalones (Porto) and her volatile nephew, Yago (Robles), even as he’s using them to fund the project. Can Miles keep all these balls in the air and make it all work? Stay tuned. What do you think? Do you like the Get Shorty TV series? Should this TV show be cancelled or renewed for another season on EPIX? Love this show- darkly funny and dealing with real people feelings…and more!! The only reason I added EPIX to my Cox bill was to check out this show they were pushing, LOVED it, it is the bomb, bought the first season on ebay to catch up, sometimes I would watch the same episode everyday (always saw something I missed too) waiting for Sunday at 9pm for the latest, it got to me like Breaking Bad….. I love this show! Please renew it. I can’t wait to see what happens next! Love it, please keep series on tv. Get Shorty is my reason for watching TV…and I’m very discerning. PLEASE keep it going!! LOVE the show. When is next episode? Get Shorty is one of the best series on television. The level of acting and writing should be rewarded by many more seasons. There seems to be a lot of creativity left in the tank. Get Shorty is inspired programming. I subscribe to EPIX specifically so I can watch this show. Should they discontinue….well…so long EPIX.